We love to have friends over for drinks—especially in the summer. But buying all the necessary accoutrements for a variety of festive cocktails is expensive and a bit daunting. A classic Negroni is one part Campari, one part sweet vermouth, and one part gin. Stirred over ice, it couldn’t be simpler to make in a big batch or on demand. Garnish it with a bit of orange peel for enhanced flavor and aroma. Not super excited about gin? 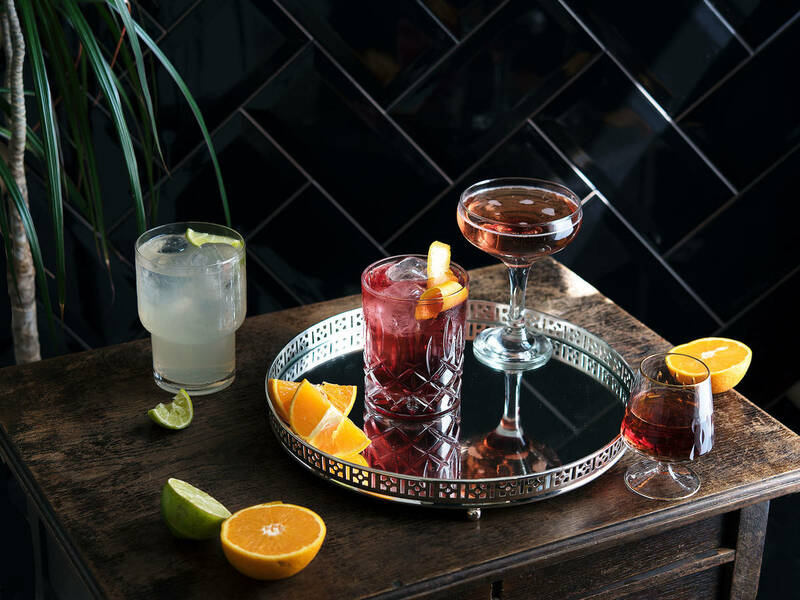 Swap it for Prosecco to make a Negroni Sbagliato, or with Bourbon for what’s called a Boulevardier. For lower alcohol content, you’ll want to try an Americano, which swaps the gin for sparkling water. The Kir Royal is great for special occasions. Champagne-based and slightly sweetened with a dash of crème de cassis, it boasts a beautiful color and screams of indulgence. You can also make the cocktail with white wine, which is then called simply, “Kir.” And the sky is the limit when it comes to flavor experimentation—try swapping the cassis for blackberry, peach, elderflower, or lavender syrup to shake things up. Most of us can get behind a round of Moscow Mules. Especially when you know that to make them, all that you really need is vodka, ginger beer, and lime. Plenty of people also love to make Gin Mules by swapping out the vodka for gin. But you can also substitute Bourbon or tequila, depending on your favorite spirit. A traditional Manhattan is made from whiskey, sweet vermouth, and Angostura bitters. Most often, it’s also garnished with a maraschino cherry, but if you’re in a pinch, it can always be left out. This cocktail is great for experimenting with different types of bitters, or swapping in an amaro, like Cynar, for the sweet vermouth. And since whiskey is the star, it’s a perfect moment for giving rye, Scotch, or Bourbon a try to see which you like best in your version. How do you take your favorite cocktail, and what do you serve your guests? Tell us in the comments and upload a photo of your next cocktail party!